-34 percent if you are a regular cell phone user and have used a mobile phone for 5 years. -58 percent if you had more than about 5,500 calls in your lifetime. -49 percent if you have spoken on the phone for more than 266.3 hours during your lifetime. One such expert is Dr. Martin Blank, PhD, one of the most experienced researchers of the cellular and molecular effects of electromagnetic fields in the U.S. He gave an informative speech at the November 18, 2010 Commonwealth Club of California program, “The Health Effects of Electromagnetic Fields,” co-sponsored by ElectromagneticHealth.org. In it, he explained why your DNA, with its ‘coil of coils’ structure, is especially vulnerableto electromagnetic fields of all kinds. -Children Should Always Avoid Using Cell Phones: Barring a life-threatening emergency, children should not use a cell phone, or a wireless device of any type. -Reduce Your Cell Phone Use: Turn your cell phone off more often. Reserve it for emergencies or important matters. As long as your cell phone is on, it emits radiation intermittently, even when you are not actually making a call. If you’re pregnant, avoiding or reducing your cell phone use may be especially important. -Use a Land Line at Home and at Work: Although more and more people are switching to using cell phones as their exclusive phone contact, it is a dangerous trend and you can choose to opt out of the madness. SKYPE offers a portable number via your computer that can plug into any Ethernet port while traveling. -Reduce or Eliminate Your Use of Other Wireless Devices: You would be wise to cut down your use of these devices. Just as with cell phones, it is important to ask yourself whether or not you really need to use them as often as you do. And most importantly, do not even consider having any electronic or wireless devices in the bedroom that will interfere with the quality of your sleep.If you must use a portable home phone, use the older kind that operates at 900 MHz. They are not safer during calls, but at least many of them do not broadcast constantly even when no call is being made. Note the only way to truly be sure if there is an exposure from your cordless phone is to measure with an electrosmog meter, and it must be one that goes up to the frequency of your portable phone (so old meters won’t help much). As many portable phones are 5.8 Gigahertz, we recommend you look for RF meters that go up to 8 Gigahertz, the highest range now available in a meter suitable for consumers.Alternatively you can be very careful with the base station placement as that causes the bulk of the problem since it transmits signals 24/7, even when you aren’t talking. So if you can keep the base station at least three rooms away from where you spend most of your time, and especially your bedroom, they may not be as damaging to your health. Another option is to just simply turn the portable phone off, only using it when you specifically need the convenience of moving about while on a call. -Use Your Cell Phone Only Where Reception is Good: The weaker the reception, the more power your phone must use to transmit, and the more power it uses, the more radiation it emits, and the deeper the dangerous radio waves penetrate into your body. Ideally, you should only use your phone with full bars and good reception. -Avoid Carrying Your Phone on Your Body as that merely maximizes any potential exposure. Ideally put it in your purse or carrying bag. Placing a cell phone in a shirt pocket over the heart is asking for trouble, as is placing it in a man’s pocket if he seeks to preserve his fertility. -Don’t Assume One Cell Phone is Safer than Another: There’s no such thing as a “safe” cell phone. This is particularly true for industry promoted SAR ratings, which are virtually useless in measuring the true potential biological danger as most all of the damage is not done by heat transfer, which SAR measures. -Keep Your Cell Phone Away From Your Body When it is On: The most dangerous place to be, in terms of radiation exposure, is within about six inches of the emitting antenna. You do not want any part of your body within that area. -Respect Others Who are More Sensitive: Some people who have become sensitive can feel the effects of others’ cell phones in the same room, even when it is on but not being used. If you are in a meeting, on public transportation, in a courtroom or other public places, such as a doctor’s office, keep your cell phone turned off out of consideration for the ‘second hand radiation’ effects. 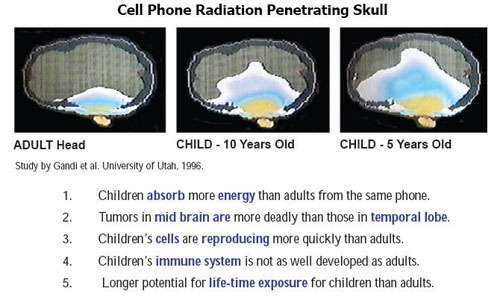 Children are also more vulnerable, so please avoid using your cell phone near children.If you are using the Pong case, which redirects the cell phone radiation away from the head and successfully lowers the SAR effect, realize that in redirecting the radiation away from your head this may be intensifying the radiation in another direction, perhaps toward the person next to you, or, if in your pocket, increasing radiation intensity toward your body. Caution is always advised in dealing with any radiation-emitting device. We recommend cell phones be kept ‘Off’ except for emergencies. -Use Safer Headset Technology: Wired headsets will certainly allow you to keep the cell phone farther away from your body. However, if a wired headset is not well-shielded — and most of them are not — the wire itself acts as an antenna attracting ambient radio waves and transmitting radiation directly to your brain.Make sure that the wire used to transmit the signal to your ear is shielded.The best kind of headset to use is a combination shielded wire and air-tube headset. These operate like a stethoscope, transmitting the information to your head as an actual sound wave; although there are wires that still must be shielded, there is no wire that goes all the way up to your head.